At Graphic Wood Technologies we understand that as a specialty wood technology company, we are dependent on sustainable natural resources. We work hard to maintain a strong symbiotic relationship with nature, reducing our carbon footprint wherever possible. All of our wood is domestically sourced, primarily from northern Wisconsin, Minnesota, Michigan, Iowa, Illinois and Pennsylvania. Every log is hand selected, and we refuse to source logs from other countries, where we can not confirm whether the log was sustainably harvested. Not only do we track each log through our system, we can track them back to the 40 acre parcel where they were harvested (above photo shows logs with data tags for our tracking reference). For every log we use, we donate back 10-15 tree seedlings through the Arbor Day Foundation. We are proud to be recognized as a part of the Wisconsin Sustainable Business Council, as well as, being awarded the Green Masters Program Certification. Our building (shown below) is outfitted with occupancy sensor lights, utilizing T5CLS bulbs which save over 50% more energy than their predecessor, the T12 fluorescent bulbs. We are currently in the process of converting to a more energy efficient light bulb, further reducing our carbon footprint. Strategically placed skylights in our manufacturing and warehouse areas provide not only free daylight, further reducing our energy usage, but also enhance the workplace environment for our employees. Unlike traditional veneer companies, our manufacturing process is chemical free, which means all of our by-product is biodegradable or can be easily recycled without damage to the environment. We convert our wood byproduct (shown below) into wood pellets, which we use in our high-efficiency boiler. This manufacturing waste allows us to heat our plant with in-floor radiant heating during cold Wisconsin winters, and reduces our dependence on fossil fuels and foreign oil. Because we do not sand in order to make our ultra thin Sheer Veneer & Pure Veneer products, we don’t use energy on sanding machines, fans or vacuums to remove sawdust from the air. And because we don’t use chemicals in fabricating our wood products, we do not release toxic fumes or volatile organic chemicals into the environment. Producing minimal waste provides a cleaner, safer workplace for our employees, and leaves a gentle footprint on the environment. 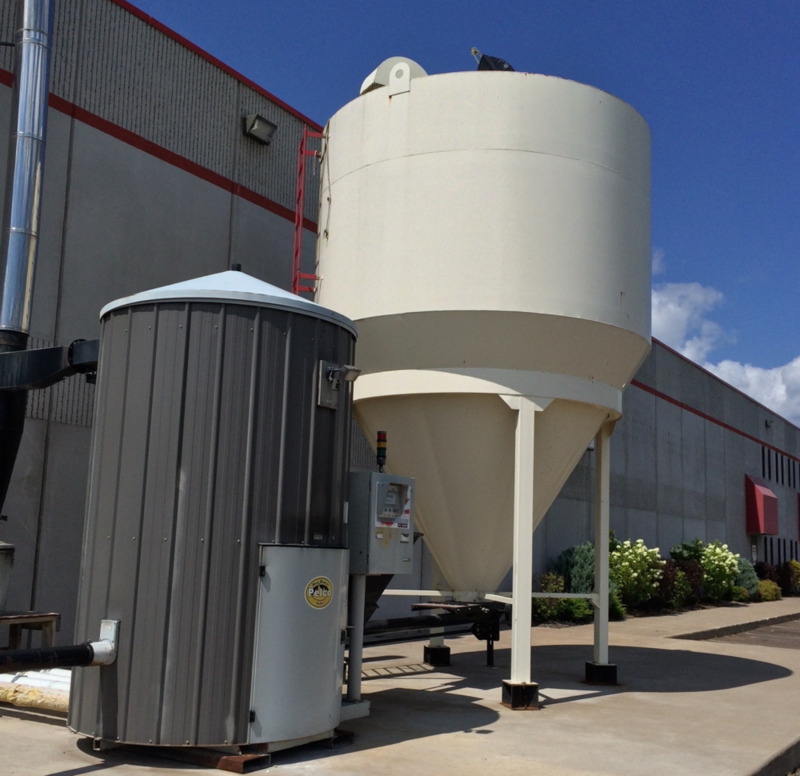 Shown above, the wood pellets we use to heat our plant and office facilities each winter. Shown at right, our high-efficiency boiler system.